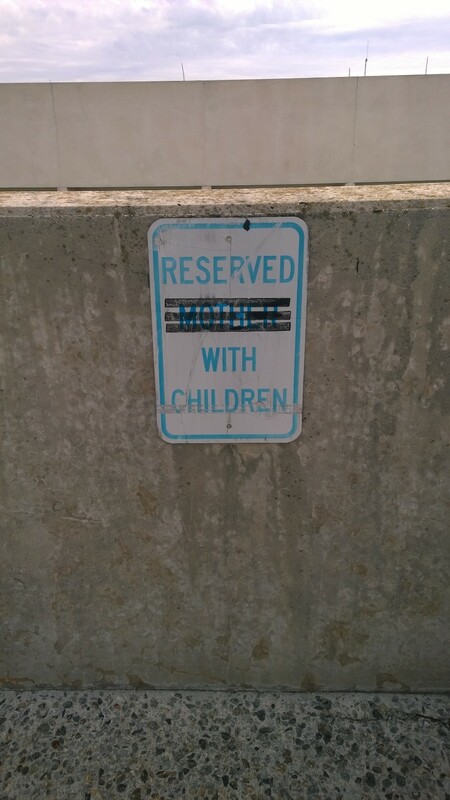 There was a time when it was reserved for “mother with children,” but it appears that someone thought the better of it and eliminated “mother” from the sign. They did so in a disconcerting manner that makes it look like Mom was run over by a three-wheeled vehicle in the parking lot at the hospital where I saw this sign last week. “Mother with children” implies that only moms take care of their children, or at least, only mom brings them to the hospital. 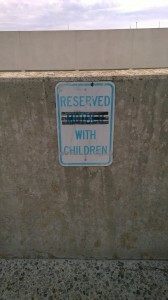 Perhaps someone complained to the sign posters, pointing out that fathers also have children, or that grandparents, nannies, aunts, uncles, older siblings with driver’s licenses, neighbors and all sorts of non-mom people are, in fact, “with children” at any given time. But let’s face it: Even in 2014, the person who’s most often “with children” is usually Mom. The Bureau of Labor and Statistics reports that women spend an average of one hour a day providing “physical care” to children under age 6, while men spend 26 minutes. I’d like to meet these people, because I don’t know how you limit yourself to just an hour (or 26 minutes) of care when your kids are that little. It takes that long just to get them into and out of the car, even when you have a special reserved parking space. One hour is about what I had last night with my own kids, teenagers who had driven themselves home while I was in New York City, working all day. (Except when I had to find the kid who drives for the kid who was abandoned at cross country practice.) That’s a very short parenting day, even for a single working mom of teens who require little “physical care” compared to a decade ago. According to the BL&S, primary childcare, defined as the “main activity,” including “talking with children,” takes on average 47 minutes per day. This is because, even when mothers aren’t with children, we are actually “with children.” (And fathers, too, though only 26% as often, it seems.) We are usually the ones in charge of the physical and the emotional and the brother-location services. It’s how come my kids text me from their father’s place about the cross country schedule and other things that their dad could find out. Or they could. Yes, I know that they do that because I answer them. I answer them, because they are leaving in a few short years and those texts are what’s left of all the hours I’ve invested in motherhood in the past 17 years. Also, because I am always “with children,” even when they’re not with me. So, thanks for the parking spot, but I think I’ll walk. I’ll leave it for the mother who’s still putting in her time.